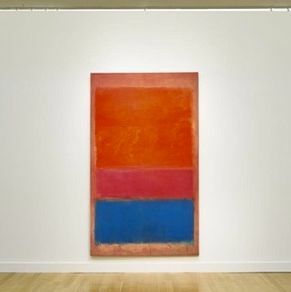 When Jay-Z raps “ran into a Rothko in my restroom” (yes, this is how some of us interface with Art), one could understandably presume, “Damn, that was probably expensive!” One may be less inclined, however, to guess that paintings by the Russian-born abstract expressionist Mark Rothko run in the neighborhood of $75.1 million, like 1954’s No. 1 (Royal Red and Blue), pictured here, auctioned at Sotheby’s for that very price on Tuesday. Estimated price: $35–$50 million.